We said it before, but it’s worth pointing out again now that the production is about to start. GM’s Chevy Bolt EV could have just as well been called the LG Bolt EV since the Korea-based electronic giant, LG, is making most of the components that make the Bolt an electric vehicle, including the battery pack, the electric motor and the power electronics. And now we learn that LG is gearing up to ‘mass-produce parts’ for the car as early as this month – ahead of the official start of production at GM, which is expected in October. The Korea Times reported the news this week citing LG officials. The company is hopeful that the start of production will alleviate the recent losses in its automotive division. 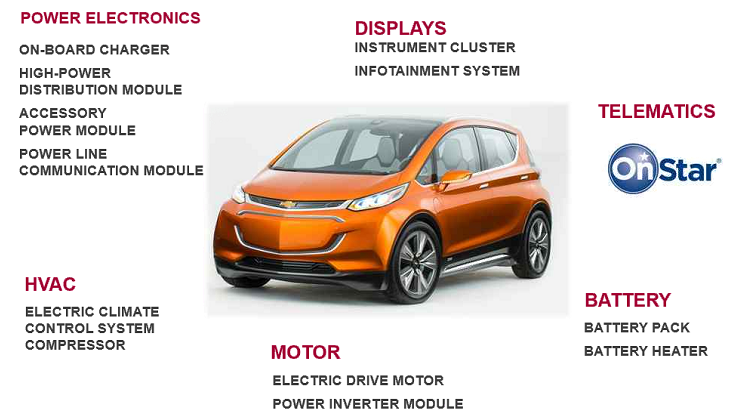 A successful launch for the Chevy Bolt EV would be significant for LG and could become a driver for its automotive business since, as mentioned, they make a lot of parts in the vehicle. All the main powertrain components, but also the HVAC system and the instrument/infotainment cluster are made by the Korean company. Coincidently (or not), GM’s Korean division also designed and did some engineering work on the vehicle. The battery cells are the biggest revenue driver. GM actually revealed that they are paying $145 per kWh for the cells (not the pack – just the cells), meaning that LG makes a minimum of $8,700 in revenue for each Bolt EV produced. LG’s parts will make their way to GM’s Orion Assembly line, where pre-production already started months ago. The vehicle is expected to hit full production in October and the vehicle should make its way to dealerships soon after. The Bolt EV will start at $37,500 before incentives and it will be able to achieve a range greater than 200 miles on a single charge. It will have a capacity of 60 kWh with 288 lithium-ion cells in three groups of 96-cell and it weights a total of 960 lbs (435 kg).